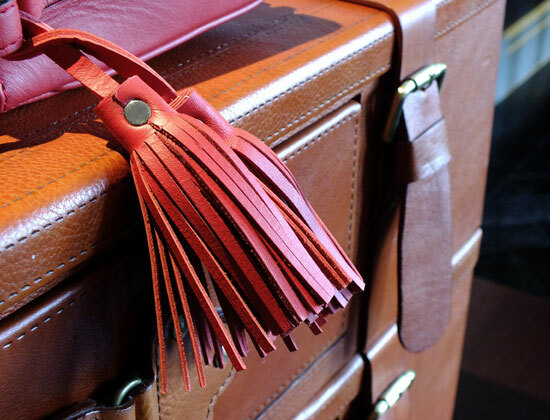 Our leather goods are made of genuine leather tanned in the methods for preserving its natural touch and feel. The colours and grains may vary as a result of leather's nature. Aging leather will acquire a patina and may darken due to the oil from your skin. But we all know that's the charming characteristic of genuine leather. We do not recommend using nano-spray or any synthetic chemical treatments on our leather. Natural material deserves natural treatment, such as whale oil and mink oil for shining them. If the leather becomes wet, wipe gently dry with a soft cloth. To regularly maintain your product, clean the dust with soft brush and damp cloth. Wipe again with dry cloth before storing in our cloth bag. Then keep away from direct sunlight and overpacked shelf. Our products that purchased through official channels come with a warranty for 365 days after the purchasing date written on receipt. For any defects from manufacturing after purchasing, repairs will be on us (with our apologies). Please email to our customer service [ at hello@monique-store.com ] then we'll handle your issue as soon as possible. If you prefer to contact customer service via email, please make sure to include a photo of your item with details about its problem. For items puchased through our distributors / resellers / or unofficial channels, please contact them to obtain information about their terms & conditions of product warranty. However items that show extreme mis-use may not be repaired and will be returned. MONIQUE warranty does not, of course, cover everyday wears nor does it cover accidental damage, or damage resulting from the application of a solvent or high-acid chemicals. Carrying weight limit of our bag is 2.50 KGS. Sales items, special discount items, including a promotional discount, and any bags without the Product Card are not covered with our official warranty. If your warranty is already expired, we are happy to offer our repair services at the reasonable charges. Your article will be sent to our repair shops, which will make the appropriate decision and let you know estimated cost and time before the repair operation is done. i) We accept Return / Exchange of our products that purchased through our official webstore, official facebook page and official LINE account. ii) For item purchased through other channels, please contact the channel you bought. They will handle your request directly. iii) Return / Exchange of merchandise must be made within 7 (seven) days after purchased or received the delivery. iv) Products must be unused, and in good condition with original cloth bag, receipt, Product Card, any gift items, and returning in our shipping box. More important, the "Sealed Paper" must stay intact as a proof of unused. v) We do not accept any returns or exchanges that don't meet the above criteria. vi) Please use EMS Post or Kerry Express services. Then notify us with the tracking number of returned package. vii) Refund of goods and return postage fee will be transferred to your account within 7 days after receiving the returned shipment. Exchanged item will be sent to you after receiving the returned shipment also. viii) By purchasing our products from any channels, it implies that you have agreed to thess conditions. We reserved our rights to change/adjust/terminate any of our conditions without prior notification to the purchaser. i) เรารับคืน / เปลี่ยนสินค้า ที่ซื้อจากช่องทางจำหน่ายของเราเท่านั้น - official webstore, official facebook page, และ official LINE account.